The publication in 1857 of Hinton R. Harper's book “The Impending Crisis in the South and How to Meet It,” infuriated Southerners. Harper had argued that many white southerners had been impoverished by slavery and that slavery was detrimental to their economic welfare. However, the book provided the abolitionist movement with what they needed to attack slavery. Then in October of 1859, John Brown led a raid against a federal arsenal at Harper's Ferry, a raid that he hoped would ignited an insurrection against slavery. He subsequently was captured after two days of fighting, tried for treason, and was hanged. At the time there was fear that what happened at Harper’s Ferry would happen again because of the abolitionist propaganda. Before long, sentiments ran so high that fistfights broke out on the floor of Congress. Then the mudslinging escalated as the Democrats swore that they would never submit to the inauguration of a Black Republican as President. Abraham Lincoln was the Black Republican that they were talking about. When the Republicans met in Chicago the following May, Senator William H. Seward stated that the United States must and will become entirely a slave holding nation or entirely a free-labor nation. His speech had the effect of frightening everyone at the convention. As a result, Abraham Lincoln was elected on the third ballot. Lincoln votes had come almost entirely from the 18 free states. The South went crazy when they heard the news. Many had sworn never to remain in the Union if a Black Republican were elected. Shortly afterward, South Carolina, Alabama, Georgia, Mississippi, South Carolina, Florida, Louisiana, Texas, North Carolina, and Arkansas voted to dissolve its relationship with the United States of America. 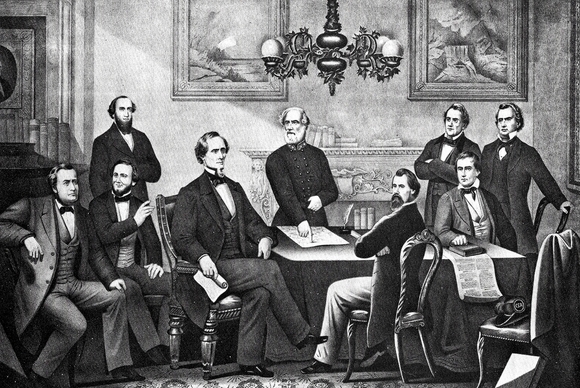 They formed a new government called the Confederate States of America. The new Confederate Constitution was very similar to the United States Constitution except it contained provisions for slavery as well as additional rights for the individual states. Just prior to the South seceding from the nation, Jefferson Davis was the United States Senator to Mississippi. He was also a West Point graduate and a war veteran having served in both the Black Hawk War and the Mexican American War. While serving in the Senate, Jefferson Davis had become a hard liner in favor of slavery. He was elected by popular vote to a six year term, and he would remain the President of the Confederate States of America for the entire duration of the Civil War. Throughout his presidency he was plagued with problems. At the same time Davis was not very effectual diplomatically. He was in constant search of money and was always hoping to receive support from the European nations, but the support never came. Things were made worse by General Winfield Scott's Anaconda Plan that implemented a naval blockade of Southern ports and gradually choked off all sources of supplies. The Confederate Army would become further undone when it suffered huge losses in both Gettysburg and Vicksburg. Before long there was inter fighting among the Confederacy due to the lack of finances, recruits, and the heavy loss of lives. One of the major problems was that Jefferson Davis refused to tax his populace, and instead issued paper money. The result was that inflation ran crazy and everything became very expensive. Then, after the Union emerged victorious the money became worthless. Jefferson Davis spent the next two years in prison in Fortress Monroe, Virginia. He was never tried for treason. He spent the remaining years of his life at his estate in Biloxi, Mississippi.